This won "garden photo of the year"
That's a nice photo of a lovely place. I've been there a couple of times--once in the summer (awfully hot and humid) and in mid-November. If you are a fan of Japanese gardens and are in the Tokyo-Yokohama area, don't miss it! Speaking of nice gardens, I visited the Sankeien in Yokohama last weekend to see the fireflies. There were a lot of people, but the setting was excellent. The estate dates back to the Meiji period, but some of the buildings there (relocated from Kyoto and Kamakura) are much older. Oops! I goofed. It was Sankeien that I've visited twice. Not the place in the picture that Heron posted a link to. It was the bridge that did confuse me. 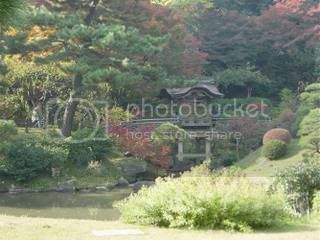 Here is a picture of a bridge at Sankeien that I took in Nov '05. 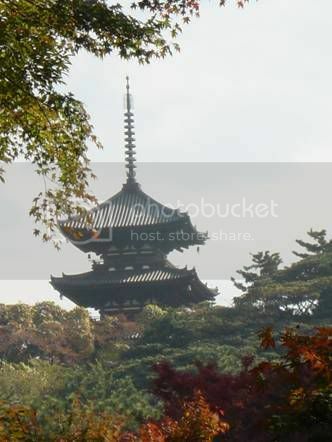 And here's a picture of the pagoda at Sakeien. I've been to both. Kenrokuen is slightly more impressive, imho, but Sankeien is not to be missed, especially for some of the structures that were imported from the west and, iirc, are some of the oldest extant buildings in the Kanto area. I believe it was far enough from Tokyo to be spared much of the damage during the war. Sankeien was nice, but (excluding the Kyoto Usual Suspects) I think the most impressive Japanese garden I've been to is Ritsurin Kouen in Takamatsu, Kagawa prefecture. The garden dates back to 1625, and the teahouse was especially nice.